The Agape Children’s Home is a safe haven where forgotten children can grow in confidence and love. The children at the Agape Home are doing well and before the New Year were working hard towards their exams. They studied hard and completed their exams. Once they had completed their exams they heard the exciting news that Ahmad Ayoubi, Stand by Me Projects Director, was visiting Burma. 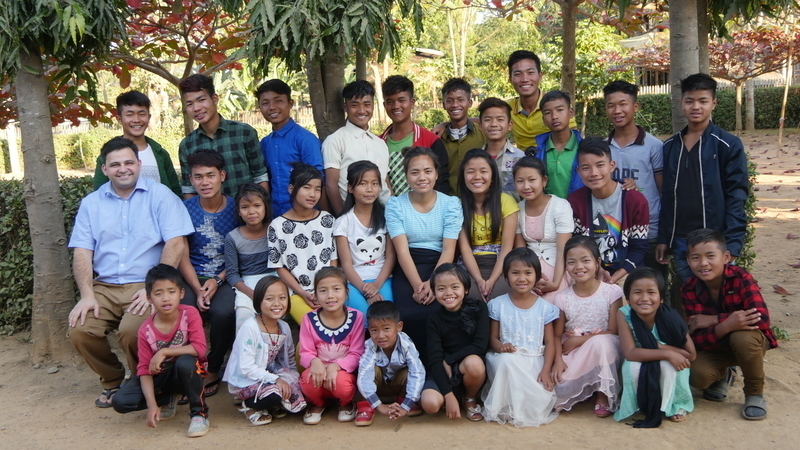 Our Agape Children’s Home is located in Moreh, a town close to the India/Burma border so our children were eager to make the short trip into Burma to see Ahmad. When it was time, the children and staff set off on their travels, crossed the border and arrived at the Stand by Me project in Tamu, Burma. Although it was only a short stay, they all had a fantastic time with Ahmad. Ahmad was overjoyed to see the Agape Home children and they made the most of their time together, playing fun games, sharing snacks and drinking fruit juice. The children performed a selection of their favourite songs for Ahmad as singing is one of their favourite past times and he enjoyed their beautiful voices. As their day together drew to a close, Ahmad encouraged the children and gave them advice. They all listened to intently as they respect Ahmad who used to be a Stand by Me child himself! There was time for a quick photo then they headed back home to their comfy beds.